Why doesn't this query use an index spool? The query takes 13 seconds on my machine with 100000000 rows fetched from the table spool. However, I don't see why the query has to be slow. 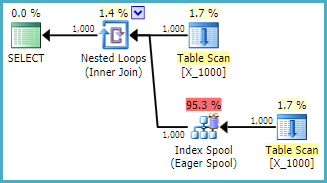 The query optimizer has the ability to create indexes on the fly through index spools. This query seems like it would be a perfect candidate for an index spool. Why doesn't the original query have an index spool? Is there any set of documented or undocumented hints or trace flags that will give it an index spool? I did find this related question, but it doesn't fully answer my question and I can't get the mysterious trace flag to work for this query. SQL Server likes to transform applies to joins early, because it knows more tricks with joins. Later on, it may explore converting the join back to an apply. The difference between the two being correlated parameters (outer references). Applies make sense when there is a suitable index on the inner side. Your example has no indexes, so the optimizer is not persuaded to explore translation to an apply. A simple (non-apply) join has the join predicate on the join operator instead of outer references. The spool optimization for a non-apply is typically a lazy table spool, since there is no predicate on the inner side, only at the join. The optimizer does not consider building an index on the fly to enable an apply; rather the sequence of events is usually the reverse: transform to apply because a good index exists. An index spool is favoured for apply because the outer reference means the selection is applied on the inner side of the join. You will often see this via SelToIndexOnTheFly but other paths exist. Not the answer you're looking for? Browse other questions tagged sql-server optimization sql-server-2016 index-spool or ask your own question. Index not making execution faster, and in some cases is slowing down the query. Why is it so?